“Account name” and “Account Description” are settings that identify the connection to the Now SMS & MMS Gateway only. These settings are not transmitted externally. “Default Sender Address” specifies the default sender address to applied to any MMS messages that are transmitted over this connection. The “Default Sender Address” is used only if the message being transmitted does not include a sender address. This address can either be a standard e-mail address, or a telephone number. If a telephone number is specified, it must be specified in MMS messaging format (+phonenumber/TYPE=PLMN). If “Allow Sender Address Override” is checked, then submitted messages can include their own sender address. 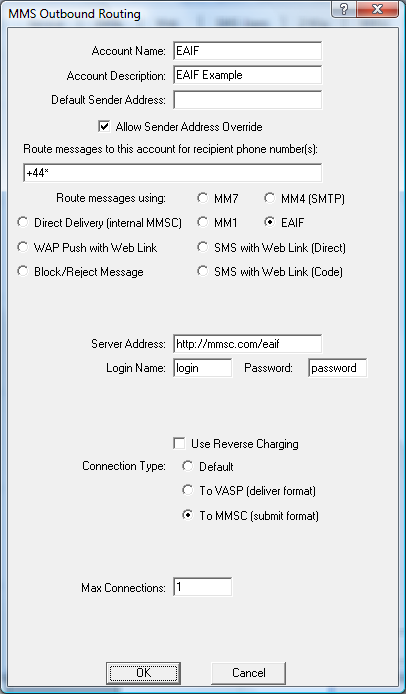 If this setting is not checked, the sender address for all messages transmitted via the MMSC connection will be changed to the “Default Sender Address”. When sending to an operator MMSC over GPRS, the operator MMSC will usually not allow a sender address other than the MSISDN of the sending phone. In these cases, it is usually best to leave the “Sender Address” field blank, and allow the MMSC to assign it automatically. To do this, leave the “Default Sender Address” field blank, and uncheck “Allow Sender Address Override”. The “Route messages to this account for recipient phone number(s)” field is an address mask for defining which recipient phone numbers should be routed to this account. For example, “+44*” would route all messages for the UK country code (44) to this connection. Multiple address masks can be defined. When multiple address masks are defined, they should be separated by a comma only (,) and no white space characters. If this field is left blank, no messages will be routed to this connection, except under special circumstances. For EAIF connections, the “Server Address” field should contain a URL for posting to the MMSC. (The “http://” portion of the address is optional.) For example, http://192.168.1.1:8080/eaif. The “Login Name” and “Password” specify an optional login name and password that will be used to login to the MMSC using HTTP Basic Authentication. “Connection Type” should be “To MMSC (submit format)” if you are submitting messages to an operator or provider MMSC. “Connection Type” should be “To VASP (deliver format)” if you are configuring an EAIF connection that delivers message to an application.